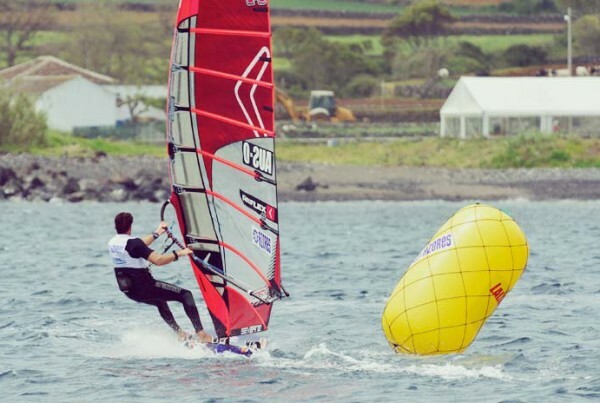 With the trend on the international racing scene for shorter races in Formula Windsurfing (FW), it is now more important than ever to get the best start possible. There are a few startline basics tutorials out there that I have seen, including one from Kevin Pritchard (now offline, but a version with just the text is in that link) and from the LBWS site, however none of them go into detail and as a result, there’s still a lot of people who waste great racing potential by not getting off the line in clean air. So let’s learn how to do it right.To get started, a few important points must be noted about starts. In a fleet of 100 boats, roughly 8-10 sailors will get a great start, another 20 will get an OK start and the rest of the fleet gets punished. That being said, unless you sail on startlines with 3-4 boat lengths per boards in the fleet, there’s usually not enough “clean air” for everyone to get a great start. Knowing the theory of how good starts are set up is important, so to first analyse this lets look at all the possible places to start on a startline. Starboard; 1/4; middle; 3/4: when the top-mark is to the centre of the course and in larger fleets this can be a more effective place to start as you can cover sailors on all sides of the course as well as use the “transit-sag” to your advantage. Now that we have a few different start options in your mind, lets look at some other important factors to think about before starting. One of the most important factors is knowing the speed/angle of your opponents. The secret to a clean start is to not have better sailors in close proximity to you who can take your clean air and/or force you to tack early. If you sail in a regular fleet you should have a good idea of who the better sailors are and know their strongpoints. You might beat them around the course, but if someone can point higher than you off the startline, its important not to start directly behind them on the line. If you are sailing in an unknown international fleet, do some line-ups with some sailors before the pre-starts to get an idea of who the WORST sailors are – they are your targets on the startline. The transit is VERY important because in large fleets there is always a “transit-sag” which is that the sailors in the middle of the line will drop 3-4m below the level of the line because they think they are over. This is what makes a middle of the line, starboard start quite famous as you can sail over the top of these sailors by 3-4m, taking their clean air and giving you a gap to accelerate into. Make sure you are at the boat when the first time signal goes so you can sync your startwatch and prepare your starting tactic. Whether you sail under the ISAF 5-4-1 system or another combination of starttimes you will never get a good start if you don’t have a perfectly sync’d watch. I always like to have a pre-defined starting position in my mind but its important to watch out for changes in the wind and be in a position where you can change your start tactic quickly. If you are sailing on a course with other divisions who have already started, watch the leaders go around the top mark and see what side of the course appears to be favoured (that’s what end of the line you should start on). Look at visual indicators such as flags on boats, flags on the beach or rising smoke, cloud movements to see if the wind has changed direction during the pre-start. A 20 degree shift in breeze to the left noticed early could mean you have enough time to blast to the pin-end, tack onto port, clear the fleet and with one less tack go around the top mark in a clear first position! Worried about getting OCS (on the ‘course-side’ of the line, before the start)?? A good international event will have race-directors who know how to apply the ISAF starting procedures. One of the ‘ideas’ that is used with pinging people for OCS is the mentality that the race-directors won’t get everyone for OCS in each race, but sooner or later, sometime in the event they will get that person who was OCS in the first race that they missed. To make sense of that, an example is on the international racing circuit, with +100 boards on the startline they will usually do general recalls if there is a large number of sailors OCS. They’ll be able to pick 4-5 sailors, who will be disqualified instantly (if its run under Black Flag) but there may have been a lot more that they missed, so they re-run the start (still under Black Flag) and again if there are a lot of people over, they will general recall again and ping more people for OCS. I have been to events where we have had up to 7-8 general recalls in a row – and about 25 sailors in total have been disqualified! Formula Windsurfing boards travel at roughly 8m/second down a startline in medium winds so as you can imagine, at that speed it is incredibly difficult for people on the startboat to pick you as being OCS if you are over a few tenths of a second before the start. For that reason it’s good to make sure you start heading to windward at the 1-second to go mark on your watch (making sure its sync’d perfectly!). 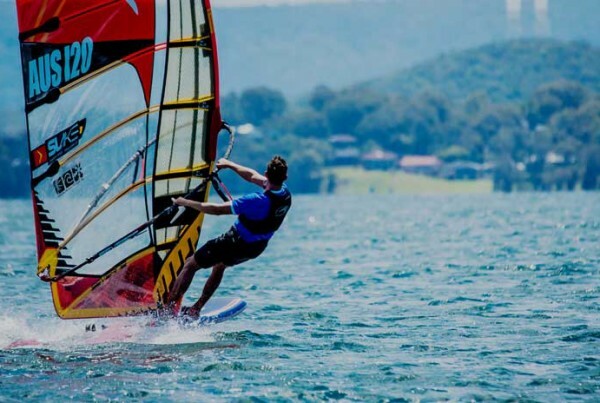 Despite what you might think, Formula Windsurfing boards aren’t very responsive to go from a broad reach to a tight upwind angle as you do when you are running the startline on starboard. It might take you as long as 3 seconds to get up to a good upwind angle out of the start and as long as 8 seconds to reach full speed. Don’t waste those precious few seconds as getting off the line right on 0 instead of +1 could be the difference between getting your nose in front of the guy behind you and giving him dirty air instead of him doing it to you! There’s a few ideas to get you started on your starts. They are without a doubt, the most important aspect of your racing and a shiny new fin won’t help you beat the other sailors if you are simply starting terribly. There’s more to starts than just the points I’ve made (especially on the psychological and emotional side) but hopefully this will help get you started. Let’s discuss some more ideas and make this article even more useful! See below to post a comment. Next PostWhy do masts keep breaking?! I never realised there was so many things going on during a start. Will have to try some of this stuff out next time. i dont think it was Devon Boulon who started at the boat in the race you talk of. the first race in melbourne? think it was gbr sailor. good writings anyways. You have a good memory. If it was a GBR sailor than it was likely to be Ross Williams. Looking through the results ( http://www.formulawindsurfing.org/filez/results/051217_2/men_after_7.htm ) you can see he didn’t actually do that well in that race… So there goes my theory! I just meant to highlight that it is possible to do a boat-end port start and sometimes it can really work to get away from the fleet in clean air. You also don’t get anyone trying to clean you up at the boat because most of the fleet is at the pin end if the line is long and pin-end favoured. I’m going to ask some people about that race now, its got me intrigued. Great writeup. There’s not much about starts anywhere on the web and all the sailing books don’t give you any tips because they are going soooooooo slow! Do you have any advice on transits if there’s a lot of people in the fleet and you can’t see your transit when you head down the startline on port? hello. great article. I run the startboats at our windsurfing events. yes, the boards travel so fast it is very difficult to spot everyone who is OCS, even with a second boat at the pin end. General recalls under black flag are a must to try and keep the fleet under control. look forward to hearing more from you. @ Theo – most likely if you can’t see your transit then you are not up on the line! If its just a local race and not a world championships, go and test that out one day. Keep pushing the line further and further outwards until you can (just) see your transit, then check if your were OCS in that race. I think you’d be surprised. Granted, you could get OCS trying that, but I think one wasted race is enough to learn an important lesson about starts. In better fleets at the international level, this becomes hard because there are plenty of people who know how to sail down the line and keep on it! That’s where practice, practice, practice and point number 3 about ‘knowing your opponents’ comes into play. If the guy in front of you is Antoine Albeau then its safe to say you can keep on his level and you will most likely be up on the line! I will try it out next time. Yes, it is just local racing but of course we are taking it very seriously. Looking forward to reading more on this blog. I think benefit from some pictures in the posts about the start and about how to do it. pictures get the message across better and help to read for us guys who dont have the best english. thanks and good luck. if you need translation to Turkish than i can help with that. @ e-okul – wow, all the way from Turkey?! Great to see we have such international readers already. I haven’t really thought about translations as yet. I think seeing as this site has only been live a relatively short time it might be best to see where the majority of readers are coming from and assess the best languages to translate to. Its a big job to translate text and as all human-translations are just somebody’s “oppinion” of the text, I would worry about losing some of the information as some of the things I talk about can be quite technical. I will definitely keep it in mind and thanks for your offer! Interesting to read about the different reasons to start at each point on the line. Now reading it, it makes perfect sense however I’d never thought about it like this before. I don’t think formula gets the credit for being tactical like RSX or raceboards but really, maybe there is more going on than we think tactically at the highest level. The thing I find hardest about formula starts is the time over distance stuff. I get the thing about sailing down the line, then heading up just before the gun. However, in our local races (as you know), the lines are often so short you can sail the length of them in about ten seconds. This also means that everybody starts accelerating well before the boat end, which turns the start into a procession around the boat. How do you approach finding a spot to accelerate into in this situation? @ Jaime – I guess I was writing more specifically about longer startlines which are very common on the racing scene in Europe. Getting away cleanly on short startlines is very similar to how you attack a port start. Generally speaking (unless your race crew are really whack! ), short startlines are usually very boat-end biased which means you should aim to get away as close to the boat as possible. To do this, you need to be very aggressive and territorial. It also requires the skill of very quick acceleration and good footwork on the board. I suggest staying close to the line within the last minute; within 100m of the startline and try to make yourself the first boat in the procession towards the line. As a result of you blocking, everyone will start heading to the line rediculously too early to try and get in front of you. Keep your cool. Edge toward the line as slowly as possible (no feet in the straps and not hooked into the harness for control – or one foot in front strap in windy conditions). Its possible somebody will sail below you and sneak in front – try as best you can to block him but that’s not always possible. With 15 seconds to go get your feet in the straps but still don’t hook into the harness (be ready to pump). Stall to a complete stop to make sure the guy behind you has nowhere to go and is in your dirty air. 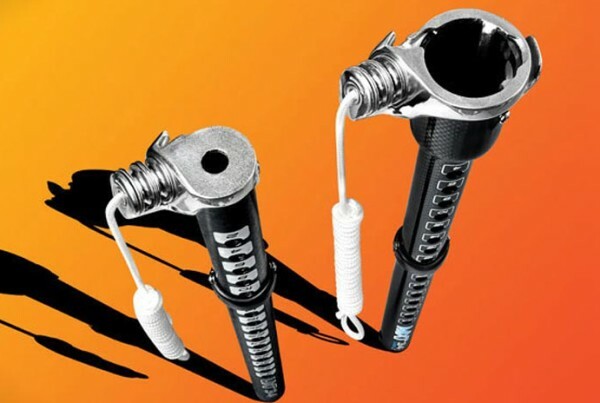 With 8-10 seconds to start pumping like your life depended on it. Foot off a little to get speed and time your run to the line to arrive on 0. Quick acceleration is the key and this skill takes a bit of practice and also some strength. You might not always be the first on the line but you at least want to be one of the first 3 boats to the line. Remember the key points to these starts are: aggression, blocking your territory, stalling/luffing, quick acceleration to the startline. At the end of the day this is a really hard start to do. Similarly to a port start, very few people get off the line clean but just remember that if you DO get off the line clean, you are most likely punishing the entire rest of the fleet with your dirty air – rather than a long startline which allows a number of sailors to get a good start. Great article and a fab. blog. I race with Toronto Windsurfing Club in Canada and we have a VERY active racing fleet (mostly LB’s but some FW and slalom). Can I pass the URL for your blog on to our webmaster to post on our website? @ Nick – thanks for reading! Good to hear of some more local fleets out there doing well. Just to add there is actually a couple of "transit sag" on a line. If you look at all the competitors on a line from an aerial view, it will not be like only one curve but like a few waves. And longuer is the start line, more are those transit sag as every competitors get they appreciation of where they are from the position of the guys nearby mostsly windward). @ jusavina – yes, you are correct. Something I didn’t think about before. I notice this a lot more in RSX in non planing conditions also as its so much harder to stay up on the line whilst you are luffing and blocking other sailors (and not planing) – although this has depreciated somewhat now that its almost mandatory to run split fleets in RSX these days, even if the fleet numbers are below 50. Back in 2004, when a lot of FW events would get +100 competitors, the startlines could almost be 300m long! In a pro fleet, there are many who know the transit-sag exists and generally keep up to the line, which is why there will be more than one transit-sag as you suggest. The top sailor will sail down the line looking for the different transit-sags (generally made by another top sailor being up on the line and the leeward boats in front of him will all be below the line [making the “sag”]) and find the most clear one, accelerate into it and away he goes. This triggers my memory of another great tactic to use with long startlines, which is to park 30-40m on the course side of the line (to windward) during the last 2 minutes of the countdown which allows you to see where the gaps (sags) are in the line. Nearing the 1 minute mark you can sail down into the gap over the top of people. This makes it so much easier to find the gaps (and weaker sailors to target on the line and sail over) as you can see the whole line at once, rather than sailing around the boat on starboard and having to dodge sailors down the line who will most likely try to block you anyhow. Great comments re the multiple transit sags (both jusavina & Sean). Interesting stuff to take in. I guess ‘experience’ is key when it comes to starts. That’s why the top guys have been in the business so long. Are you ever going to make a post regarding slalom starts? @ Lechner08 – when I head back to Europe again in a few months I plan to get some of the top Pro’s involved with writing some articles/interviews.